And the winner is Bee (bu_______@gmail.com) whose loves Medium Grey (don’t we all?!). I’ve sent you an email Bee! Thanks everyone for sharing your favorites. Emily likes to play with rotary cutters much like Edward Scissorhands likes to play with hedge trimmers. ‘Smithereens‘ is what happens when Emily and her rotary cutter meet a roll-up. Much chaos ensues. The Summer 2014 Robert Kaufman Kona Cotton colors were fresh and new when this project started and I couldn’t wait to play with them. The best way to play with that many new colors all at once is with pre-cuts of course. Add in a background color and ta-da! After laying out the triangles, I auditioned backgrounds. I seem to make most quilts with White, Snow, Natural, Parchment, etc backgrounds. I really do try to branch out but that rarely seems to happen of late. So one day I sat there in Illustrator and went through every bold color in the Kona line. Regal was the winner… with a vibrant orange as the second choice. The result was Smithereens … maybe this will make me stop using white as a background in every quilt. The Smithereens pattern is available in the shop. 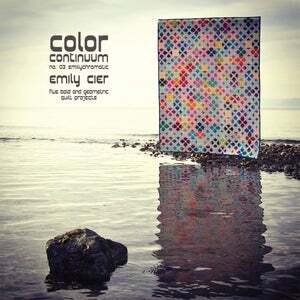 For the Giveaway: One lucky person will win a charm pack of the Emily Cier Designer Palette (oh wait, that’s me!) from Robert Kaufman and a copy of Smithereens from me. To enter, comment below sharing your favorite go-to Kona color. Comments will close 10am (pacific) Tuesday, December 2. Speaking of the Emily Cier Designer Palette, the projects that accompany it are in the shop and available for pre-order now. Color Continuum no. 03 is also available from Amazon . Lots more details on Color Continuum no. 03 and Percolate this Wednesday! 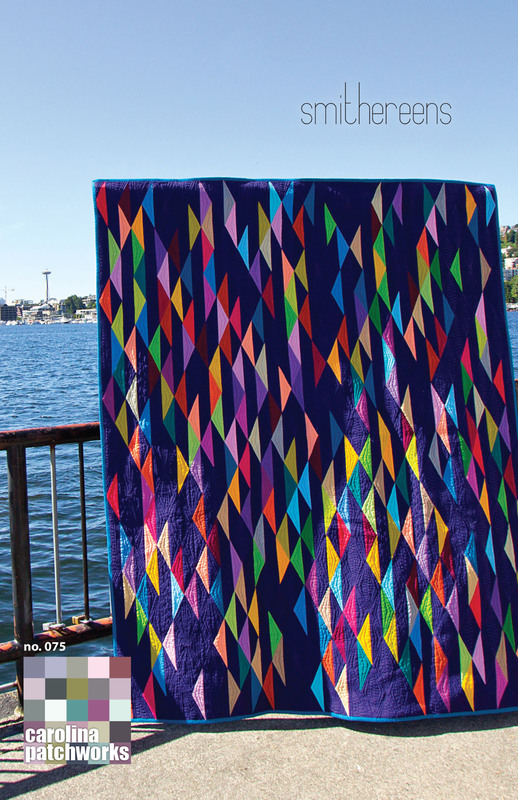 Check out all the other beautiful quilts from the 30 Quilts for 30 Years! Previous Previous post: 7 Year Anniversary Sale! I’ve been hearing about quilts with colors other than black, white, cream for backgrounds. I’m liking this idea. Gray, silver have been popular lately. I’m liking the navy and royal blue idea. My go to color may be changing to navy. Beautiful quilt, love the colors. My go to color is Heliotrope Purple. My new favorite is Sangria! My go-to colour is Snow!! Love your quilt and the design is spectacular!!! I have never used Kona fabric, but I really like the color Bordeaux. My go to color is Snow. It is a lovely soft white that doesn’t have a yellow tinge to it. I like Sprout and Cabbage! I like Medium Gray as a neutral, as my palette runs to blues and greens. My go to Kona is Ice Frappe! 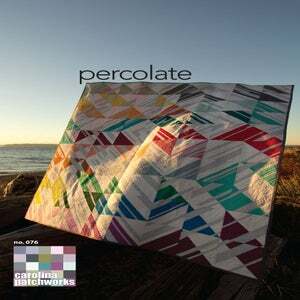 Love your Percolate pattern! I really like Glacier. Have a great day. Your quilt is stunning. I have used Kona Ash for a few quilts, so it’s probably my go-to right now. Congratulations on your beautiful quilt design! Go to color? When I have color ADD? Today my color is terra cotta. I like Glacier – just finished binding a quilt with it. I love this quilt! My go-to colour is white, but I also love indigo. Haven’t used that on a large project but one day soon….. There are so many lovely colors, it is hard to choose one. I love so many of the colors-almost impossible to choose. So often, it just depends on the project. I have to go with snow, I think, because it is so easy to build upon. I just adore your quilt!! Love the quilt especially the regal background. My go to color is black. Right now I am loving on their Canary — I am hung up on golds. All of the colors are beautiful, but my go to color (if it isn’t one of the blues) is Snow – it goes with everything. Thanks! 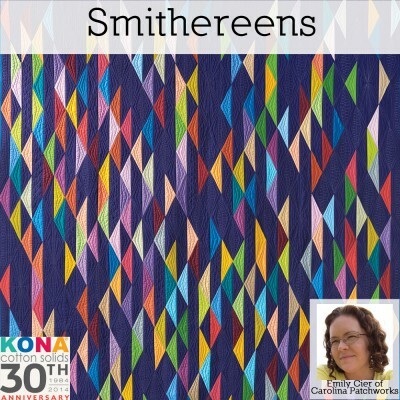 Your Smithereens quilt is beautiful and I usually go to a dark background because it picks up less dirt. The yellows are among my favorites and my particular favorite is Citrus. Thank you for a beautiful quilt. I love using Kona black for my background fabric. Love Regal as your background! I use Kona Snow the most, but I love Jade Green. That regal background color is PERFECT. Love this quilt. 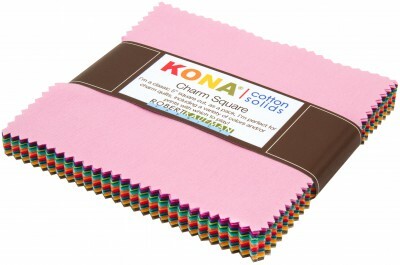 New to Kona solids, no favorite go to colors, yet. I like all Kona solids and have used them for years! smithereens is awesome, good use of brights and very dramatic. thanks for the giveaway and sharing your work! Smithereens is fabulous! Congratulations on being included in the 30 Quilts for 30 Years. Hoping to win the giveaway – my favorite color du jour is Honeysuckle. I use Snow like it’s going out of style. HI, REALLY LIKE YOUR QUILT! MY FAVORITE KONA COLOR IS ‘SNOW’! My go to color is Tangerine! Smithereens is definitely in my kinda of colors. THank you for sharing. My go-to color? I’d say it’s either Shadow or Ash, since I use grey in so many of my quilts. I love how versatile the Kona solids are, and LOVE that there is such an amazingly WIDE variety of colors! I love your quilt…your choice of background color is perfect, it really makes the triangles pop out. I just finish a quilt using eight different Kona Solids. It was fun to see the colors come together as I was sewing each row. I love all shades of blue. I guess I’m like what you said, I’ve been using ‘Snow’ for background. Your quilt is amazing and congrats. Thanks for the fun. i like medium grey for a neutral! My current favorite is Robin Egg but there are a lot of others I haven’t had the opportunity to try — some of them may become favorites one day! Your quilt is amazing! My go to is Indigo. Your quilt is my favorite of all the 30 for 30 ones I’ve seen. So pretty. My go to color has been Kona Steel. Emily Cier I love love love your quilt!!!!! Beautiful quilt with a fun name! Awesome! My favourite go-to colour is Kona Snow. Over the years I’ve used it so much in my quilts. I never seem to get tired of it! Silver seems to be my go-to color of the moment. Wow what an amazing pattern! My favorite color is Eggshell. I use a lot of neutrals in my quilts. Thanks for the giveaway! My go to color is snow! I can’t help it, I just love that color. It goes with just about everything. I love all the colors tho. I’m a rainbow lover! Any shade of purple works for me. Love your quilt. Thanks for the chance to win. whoops and forgot to say….glad you are doing great things in the quilting world. We were both in the Triangle Modern quilt guild back when it started. Love Love Looooove your quilt! & colors!!! Well, Snow is the choice when I need a neutral , but I really love the reds! My favorite go to color is Snow then petal! I love the colors it is so hard to pick one! I love Smithereens, so beautiful I definitely have to get a copy! Thanks for the giveaway! 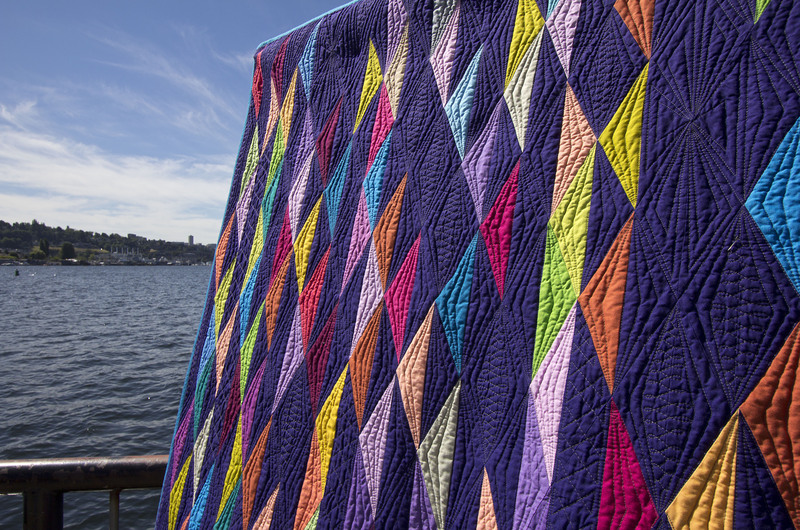 Emily, your quilt is a stunner! My favorite colors at the moment are all in the water/seaglass family–Pool, Lagoon, . . . I need to get some of that umph you had when you traded out your neutral for Regal! So glad the Kona Hop brought me to you. Your work is incredible and now you’ll be in my inbox! Can’t wait! Right now I really love Snow. Pomegranate always speaks to me! Cerise is my favorite. It makes other colors pop! Hmmm…. favourite colour… I might have to pick Ash. iI love the way it works with pinks and reds. My go-to color is Lagoon. It brightens any project. Snow is my second go-to color. I love your Smithereens! Just makes me smile. I use snow the most but my favorite is Sangria. The quilt is beautiful. I wonder what it would look like with grey as a background instead of blue? Your quilt is a work of art. I love the color berry! How could anyone pick just one color? I love them all. Probably what I would use most would be Snow. I love Smithereens, especially the blue background! My favorite Kona color is cerise. Thanks! Hard to choose but I think Sprout is my favourite. Love your quilts! Wow, I love, love, love this pattern ! Fingers crossed. I like your quilts—and I likrpickle. Thanks! I go to snow first for the background. Love your bold blue choice for the background. I’m loving Lagoon lately. Great quilt! My go to color is Snow! I’ve enjoyed seeing all of these quilts. Oh I want to win this SO BAD! My favorite kona solid is curry!! smithereens is AMAZING! and nice choice on going with something different for the background- seeing how someone else makes a big change is inspiring to get out of our own ruts. my fave color is completely snow, but i’ve been wanting to make something with cerise, pomegranate or coral!